The Real Estate Life Cycle is best visually compared to a revolving door at a busy shopping center. This shopping center is always open for business, 24 hours per day and 7 days a week. Just like that 1960’s song by The Byrds – Turn! Turn! Turn! It never ends! The diagram concept (shown below) is an elementary yet detailed approach at everyone’s role in real estate. So whether you’re the race car or the thimble, everyone plays a role in the great game of real estate. The bulk of the cycle is devoted to residential real estate, the commercial/investor category has multiple cycles within itself. We’ll get into that at a later date. The concept and vision of the real estate life cycle post came to me as many of my friends, real estate industry peers, and family, constantly asked me about my business, such as: “Which type of client do you focus on the most?” Where I often have the sweet answer: “whoever has a real estate need.” This short simple answer is really the best answer, however it can be received as a murky response. When people dig deeper into the question of where my business derives from it could be categorized into Commercial Real Estate and Residential Real Estate. This is true, yet I prefer to dig down to the deep roots for the real answer. 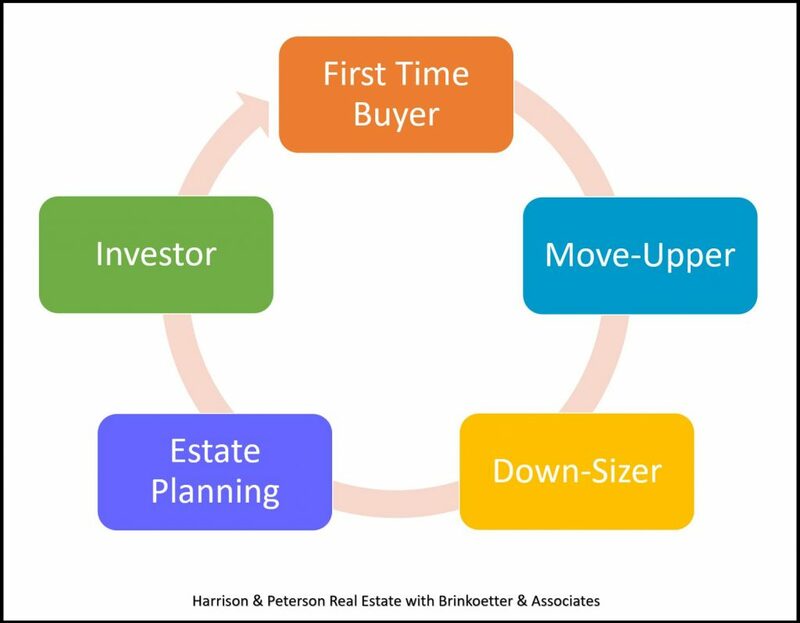 The real estate life cycle shows this and it displays almost every client my team and I serve. It’s our goal to serve every client equally as they all have a real estate need. Notice I start the Real Estate Life Cycle with the First Time Home Buyer although everyone technically starts at a renter. Renting is the business of the Real Estate Investor. So therefore it’s covered in that final category. Myself being a young professional and experienced by successfully purchasing my first home at the age of only 19. I love assisting First Time Home Buyers throughout the home search and home buying process. My team and I have a presentation specifically for First Time Buyers that we love to share with folks considering buying their first home. I will be sharing an in-depth look at the First Time Home Buyer presentation at a future date. Purchasing a home for the first time is one of the largest financial decisions most people will make and we have a strong belief in offering our professional guidance every step of the way. The transition into a Move-Upper is also an exciting yet often slightly more weighted process. A traditional Move-Upper is someone who often has a growing family or lifestyle and has a need for a larger home. When you’re “moving on up” it often requires selling your first home. This is a category where my role as a real estate broker is doubly important. Not only do we offer guidance on the home search. The search for “the one” that meets all amenities and features that the first home may be missing. We also offer our professional counseling in preparing your home to sell. If done correctly this process is often a smooth transition. In the video I mention “contingent upon selling” and “relocation” these are sub topics I will explain in more detail on a future post. Moving-up is another rendition of growing-up, there will come a time for more space. We love assisting on both fronts of the Move-Upper category. The Down-Sizer often comes many years after the Move-Upper stage. The down-sizer pretty much equates to the polar opposite of the Move-Upper. Although I can’t speak first hand at this stage. I continue to have the pleasure in assisting empty-nesters find that perfect home for the next chapter in life’s journey. This is often the stage where folks realize they have spent the majority of life growing. Now it’s time to simplify and experience the joys in life that material items and unused square feet can’t provide. My experience shows most Down-Sizers seek one-level living and easy maintenance property. Like moving up, down sizing often requires selling and buying. It’s crucial to use a Realtor in both categories. My team loves assisting those seeking to down-size. If you’re considering down-sizing it’s never too early to start searching and planning the move. The Estate Planning stage isn’t glamorous and often no one wants to talk about it. But no doubt it’s important. There are many ways to prepare for this such as transferring real estate assets to Land Trusts. This is something you should first consult with your Attorney, Financial Advisory, or Accountant on the best methods to protect and pass along your real estate assets. This dark stage is an equally important part of our business. We work with trust officers and multiple decision makers to sell loved one’s real estate to the highest and best user. Sometimes the best user is a real estate Investor. The real estate investor seeks opportunities where a profit can be made. Home Flippers are often one of the entry’s to real estate investing. A flipper buys a home that needs work for an undervalued price, then adds value and sells for a profit. A flipper is one form of a real estate investor. Other investors may specialize as landlords, owning property and renting the property for a profitable rate of return. Of course real estate developers are another form of real estate investors. Developers envision a better use for a property and take on the risk of changing that property for the better use. We’ll save diving into the commercial real estate investor category for another date. In conclusion, ironically in real estate there’s no conclusion. So as it’s nearing midnight and I’m finishing a long day celebrating my sales victories and decompressing by blogging and ‘vlogging’. I’ll end with a short quote I was told about a decade ago from one of my early mentors “real estate never sleeps, only we do. ” Stay tuned for future posts. Feel free to leave comments and share. Good night friends.